Animailers is a Maryland based pet travel agency that has been transporting pets and other animals successfully since 2000. Serving the Baltimore-Washington, D.C. metropolitan area, Animailers is less than 15 minutes from Baltimore-Washington International Airport (BWI) and within a 90-minute drive of Ronald Reagan Washington National Airport (DCA) and Dulles International Airport (IAD). We also provide ground transportation along the Eastern Seaboard. We also can provide ground transportation throughout the continental United States for animals with special health needs. Animailers provides complete pet relocation services to U.S. military personnel on overseas PCS assignments. With our knowledge of international animal transportation and our access to the most current animal import regulations for virtually any country, Animailers provides comprehensive pet relocation services to employees and contractors of the Department of Defense, State Department and other U.S. government agencies in Foreign Service or traveling on overseas assignments. Of course, these same services are afforded to anyone on a corporate international assignment. Diplomats and other foreign visitors returning home upon completion of their assignments can contact Animailers to arrange for their pets safe journey home to their native country. 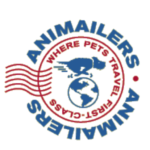 Animailers is licensed by the USDA and a member of the International Animal and Pet Transportation Association (IPATA). We comply with the Animal Welfare Act and the International Animal Transportation Association's Live Animal Regulations (IATA/LAR) for every detail of your pet’s move. We are fully insured for all ground transportation. We treat your pet like one of our own, providing plenty of TLC, to make the journey as stress free as possible. All it takes is a few minutes to complete our Animailers' Estimate Request form to start your four-legged family member on its way. Warning: If you are considering purchasing or adopting a pet, please be careful. Internet scammers sometimes take advantage of innocent pet lovers' good nature. Please take a moment to read this important announcement from IPATA, the trade organization for pet shipping professionals, on how to avoid and/or report suspicious activity. Remember, if an offer seems to good to be true...it probably is.